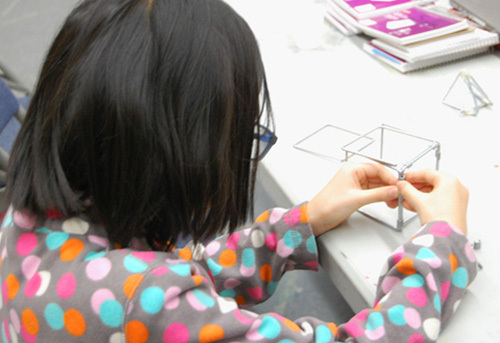 The 92Y in Manhattan wanted to offer a 15 week session afterschool course based on design thinking that would incorporate the newest tools in the maker movement. Along with a 3D printer, the DIWire was integral to the course as students learned to take ideas from concept through prototyping, testing and iteration. Afterschool programs have their own challenges: shared space, limited time, and often mixed age groups. For the Design Lab, eight students aged 9 to 12 joined up based on their general interests-- none of the kids had used digital fabrication tools before, but all had interest in exploring the world of design. Activities were created to expose them to design principles, starting with constraints and considerations. They built up brainstorming skills, taking ideas from sketches through rough prototypes. The skills needed for adding technology to these processes were introduced at the beginning of each new challenge: 3D modeling with Tinkercad, 2D file manipulation within Wireware for the DIWire, and even a little Adobe Illustrator for the more advanced students. These challenges were created by Pensa Labs' Kelly Saxton along with the Pensa Labs team.The DIWire was great because it made it possible to move kids from drawings to software and into the physical world quickly. This meant kids got to make up to four projects with it, while they were limited to about 1 for the 3D printer due to time constraints. The DIWire was great because it made it possible to move kids from drawings to software and into the physical world quickly. This meant kids got to make up to four projects with it, while they were limited to about 1 for the 3D printer due to time constraints. “It was great to see creative problem solving going on as the kids applied new skills to new challenges,” said Neva Koc, one of the instructors. They were proud and confident sharing their inventions more formally as well- they were able to explain the steps they took to think through each project.